...Or maybe it's Aberlady of the Peonies. I have finished Aberlady my 4th sweater from Knitting in the old way and I must admit I really enjoyed knitting it. I even managed to find an attractive model to wear it for the picture. She complained a little - it was about 28 degress celsius at the time. Alas cooler weather will be here before we know it. 1. Use a flower motif that was not an eyelet pattern. I like the texture in the leaf pattern and think that it should be carried out in the flower pattern as well. I might have done this, if I hadn't been so obsessed with wanting to use the Garland stitch pattern from Barbara Walker's second treasury - somewhere, anywhere -why not here!! 2. If I decided to keep the eyelet pattern I would add a few more rows above & below the flower to set it further apart from the garter stitch. I did angst over the leaf pattern at the neck. I find that little pieces of a pattern that appear at the neck edge often look as though they are lost because the rest of the pattern has been taken out by the neck opening. Some pieces I kept and some I didn't. 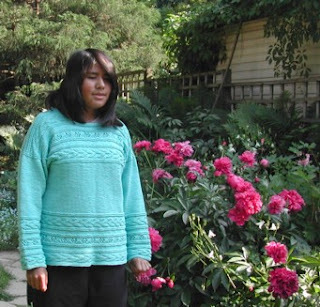 What I do really like about the sweater is the way the sleeve pattern matches the pattern at the bottom of the sweater. Getting there. I have even cast on and knit a bit on my fifth sweater - a gansey with extended panels. Well I extended the ribbing and began the pattern just above the waist, so it will be quite extended by the time it reaches the shoulders. I'm not sure that I have interpreted "extended" correctly - but well, let's see what happens. 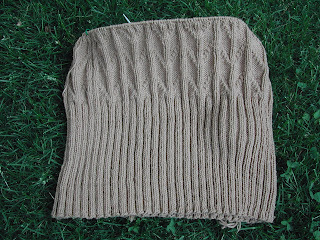 I am using Fiddlesticks Knitting Ecoknit in coffee. This is an organic cotton DK weight yarn - a good choice, I think, for warm weather and I am calling it "Gifford". Gifford is another delightful town in East Lothian with a pub that has an even more delightful name. It's called Goblin Ha' (hall) and yes, it is said to be haunted. Over the years, Goblin Ha' has lost some of its old pub look in favour of a more refined interior; but I'm sure that at one time it had beamed ceilings and lots of wood detailing - hence the design in the sweater. I know that the garden eating area has been turned into a restaurant with a vaulted ceiling, skylights and a first class menu. The food was generally good in the old garden lathe, at little more rustic but very charming - actually old and new has been merged very nicely at Goblin Ha'- now where is that ghost? I am so thrilled to have discovered your site. I have been reading your entries since you started your PGR creations. I love it. I hope you are planning to do more.